Weather (18:00): Sunny. Temp. : 30°C, Humidity: 59%, Dew Point: 22°C, Wind: SW 18km/h, Pressure: 101.6kPa, Vis: 24km, Humidex: 39. Weather (19:00): Mainly Sunny. Temp. : 29°C, Humidity: 66%, Dew Point: 22°C, Wind: SSW 15km/h, Pressure: 101.6kPa, Vis: 24km, Humidex: 38. Weather (20:00): Mainly Clear. Temp. : 27°C, Humidity: 75%, Dew Point: 22°C, Wind: SSW 13km/h, Pressure: 101.6kPa, Vis: 16km, Humidex: 37. Photos taken by Celia McInnis and Geoffrey Wright. Nice warm temperatures with a fairly light breeze resulted in some good performances tonight despite the rather high air pressure. Of the six individual riders who had ridden a previous 2010 WTT event, two - Mary Ajersch and Julie Belanger - improved upon their previous season/series best. 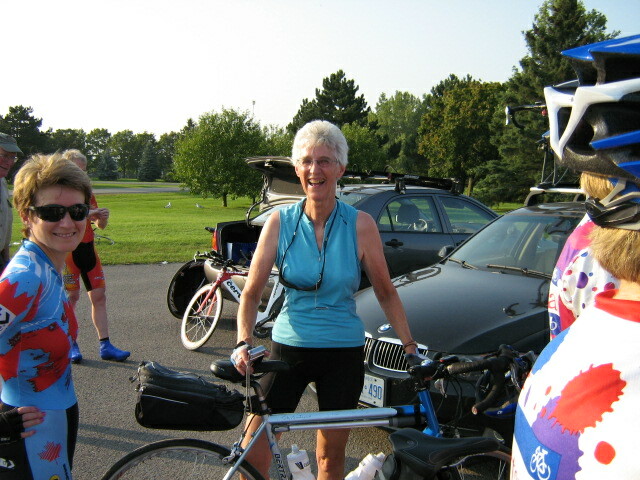 Note that Mary's ride of 25:52, a season/series improvement of more than 9%, sets yet another 70-79 year old best, improving upon Mary's earlier mark of 26:39 by 47 seconds - Congratulations Mary! Likewise for the multi-person teams who had ridden earlier WTT Invitationals, two - Cameron/Ingham (by 12.6%) and the Schucks (by 6.28%) - out of six improved over their previous database best. As well, and as would be expected, the tandem paid of Douglas van den Ham and Louise Boutin which did 21:51, improved considerably, by more than 8 minutes, over their previous attempt on two bikes. Lots of fun as always, and I hope that my TTT partner, Christina Czaban, has recovered from the terrible back and neck spasms which arose at the 6km mark in the course. The good news is that amongst the WTT people there, two are physiotherapists (Flavia Nascimento and Veronik Bourgon), and they came to the rescue immediately after the race to help. Luckily the ice which Lisa brought had not all melted! Yes, quite a good set of abilities amongst the WTT women - knowledge in health care, law, all aspects of computers, translation, mathematics, real estate, teaching, chemistry, engineering, and so on! The company is as enjoyable and stimulating as the athletic competition is. I hope to see many of you throughout the off season! -- Celia McInnis. Four of these results were first posted on the OBC site until about 07:30 on 2010-Sep-01 at which point the remaining ones were added. The results are also available here for your added pleasure and analysis. Thanks to our Helpers: Sandra Bender, John Cooper, Bernard Durand, Kari Ferlatte, Margot Hall, Lisa Hébert, Bob Hicks, Laura Johnson, Patricia Konantz, Nancy Manning, Wendy Van Der Weyden, Don Wilson, Geoffrey Wright.